With classic clean style good looks that is ready for fall fashion. 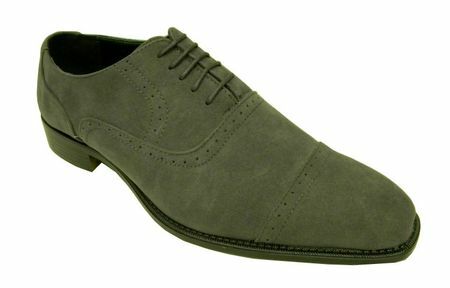 These solid gray suede cap toe shoes from Amali will be more than welcome to your fashion wardrobe. Featuring a cleanly styled cap toe design with Italian inspiration, you will be more than inspired to wear them with your fall suits and walking suits. Just make sure to pre-treat them with water repellant spray to keep them looking their best. Check out our Mens Formal Wear for times when evening wear is necessary. Make the most with our selection of Cheap Suits.